This article first appeared on GR in June 2017. 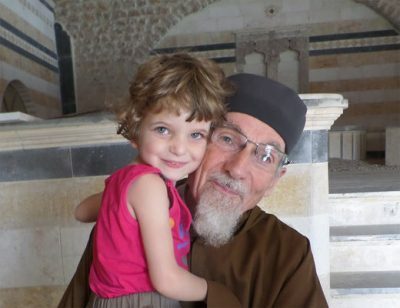 Since 2010, Father Daniel Maes (78), from the monastery of Postel in Belgium, has been a resident of Syria’s sixth-century Mar Yakub monastery in the city of Qara, 90 kilometers north of the capital Damascus. He has returned to his home country several times in the intervening years to give seminars, but remains living in Syria. I interviewed Father Daniel recently. The following is his story. He told me why he went to Syria in 2010, and how he experienced a culture shock when he first arrived there. He also explained that there never was a civil uprising in Syria, touched on the propaganda surrounding chemical attacks, relayed heartbreaking stories from Syrians themselves and praised the great support they receive from Hezbollah, the Syrian Army, and Russia. And that’s when I decided to go to Syria. I had never had any contact with an Arabic country, so I had many prejudices. I thought that one had to be very careful in a Muslim country. To describe my experience in just a few words: It was nothing less than a culture shock to me. The hospitality that I experienced there was amazing, and the majority of youth, and the different kinds of people, from all walks of life and religions – Shiite, Sunni, Orthodox, Catholic, any possible religion – were all united. Regarding the country as a whole, life was harmonious; I have never seen such a harmonious society. She was a beautiful lady, and she could safely walk the streets. In addition, treatment at hospitals was free, except medicines (all made in Syria! ), and following a program of study at the university cost around 20 euros. On the whole, I witnessed a prosperous, safe, hospitable, and harmonious society. And refugees, about one million from Iraq and some from Bosnia, were treated as their own citizens. As soon as the lies started pouring in, I started my fight against those lies with the truth. One journalist claimed that when he was in Syria, he “asked for bread, but received bullets instead” – as if to prove that there was a civil uprising. Let me tell you, when I was in Syria before the war, 10 loaves cost 10 cents – a tenth of a euro. What nonsense this journalist was spouting. That has been my battle; against those lies. The West was trying to ‘find’ any reason to murder that country. On a Friday evening we went to the priest in Qara. We would occasionally go out here and there to Christian families to pray for those who were ill. At some point we went to the presbytery to get food, we were walking, and on the street there was the main mosque, where we saw a group of young people. They were screaming, yelling and held anti-Assad and anti-Syria banners. The priest told us later on that they were not Syrians. They came from abroad. They were filming their ‘demonstration’ and were paid generously by Al Jazeera for that. That was the so-called civil uprising. Thankfully, that was still at the very beginning, otherwise we would not be alive today. It was a very unpleasant feeling as we walked by those people to go to the presbytery. At the time we didn’t know it was so organized. We heard from friends that the same occurred in other places. Since troublemakers are not wanted in any of our villages, this group of young people were not supported by anyone in the village. Still, they managed to grow. It grew to arson attacks and armed violence. The priest was also attacked, robbed, and was able to barely escape from strangulation by masked men with strange accents. There was NO uprising, or so-called ‘civil war’; from within, there was no reason for it. 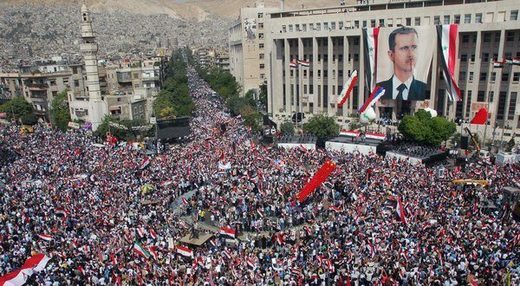 The great majority of Syrians continue to support their democratically elected President, as well as the Syrian Army. The story surrounding the chemical gas attack in August 2013 was a disgrace. Not a single journalist reported on the irregularities, and didn’t ask any critical questions. In early August 2013, 11 villages were attacked in Lattakia. People were killed and homes destroyed, and many children were kidnapped. We tried to help find them. A list was compiled with their name, gender, and a note on whether they were missing, had been kidnapped or were murdered. There was not a word on this from the media. Obama had announced in 2012, under intense media interest, that the use of chemical weapons was a ‘red line’. In other words, a reason to invade or attack Syria militarily, which the ‘international community’ was impatiently waiting for. Syria gave the UN and its agencies dozens of letters with evidence of chemical attacks by rebels, which was confirmed by nuns at a hospital in Aleppo. Not one letter has been answered and not a single attack has been investigated. An official commission of inquiry was sent to Damascus and, while they arrived safe and sound, a massive chemical poison attack took place in nearby Ghouta under their noses. Western heads of state immediately expressed their horror at the atrocity, which they assumed had been ordered by Assad, and before the commission even began investigating it. In addition, the heads of state gave very different figures, ranging from 200 to 1,000 deaths. Apparently, they were better at agreeing amongst themselves who the culprit was (Assad) than they were regarding the number of victims. The 35 professional videos, published right after the attack, showing a great number of dying children, went around the world. Left out was key context; that region had long been abandoned by families because of the fighting. And nowhere was a mother or an elder to be seen! Parents from Lattakia recognized their kidnapped children. Some were lying in different positions in the pictures. How is it possible that no parents were present in those photos and footage? How could they even publish all that documentary evidence so soon after the attack? Why were the bodies of those innocent children neatly put together in one room? And that in a Middle Eastern village which was already emptied – how could there have been children there to begin with? Instead of asking these questions, accusations were thrown around before any investigation took place, making it clear to me that it was a set-up. In my efforts against the lies, I try to make it clear that what people say or think is not neutral. It is important to ask: Are you standing side-by-side with the murderer or do you stand on the side of truth and the innocent victims? Also, everybody should know by now that the WMDs story of Iraq was nothing but a lie: there were no WMDs. Now they’re telling us that Assad is killing his people? Everyone who has even a bit of a brain will understand immediately that all this is a set-up, that these allegations do not hold water. The Syrian people know who their killers are; the terrorists – and they know who their protectors are, the Syrian army and their allies. So I can’t help but ask journalists: are you so stupid to think that the people here are too stupid to know who the murderers and saviors are? To this day, there are posters and pictures up all over Syria praising Assad and Putin – that is the reality. I have many stories from Syria. I will tell you a couple. In early May 2016, dozens of Syrians and Lebanese came together at a festive meeting for martyrs. There were such touching stories. A woman with a baby in her arms was there, with a tear in her eye and a smile. Her loved one was killed by the terrorists. These people greeted me kindly as a European foreigner, but you can’t help but feel ashamed. There was also the Muslim family of Fawad. The Christian neighborhoods of Homs were the first ones the media reported as ‘freed’ by the so-called rebels, who had murdered, plundered, and destroyed. 130,000 Christians were expelled, and Muslims also suffered a lot due to the horrors of the ‘liberation’. Fawad’s father told how his only son was a student at the University of Homs. On a certain day, he didn’t come home; he had been kidnapped. All searches were in vain. They felt so lost, and so tired of suffering. 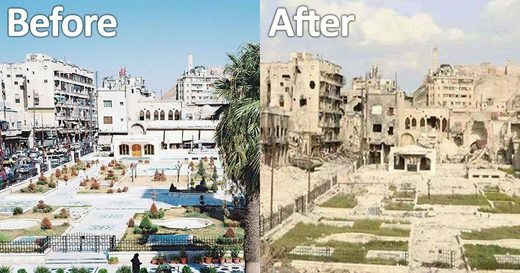 Before and after pictures of Syria. Do people truly think ‘rebels’ have Syria’s best interests at heart? Since 2012, our town of 25,000 residents quickly grew to 80,000 with strange bearded and heavily-armed men. Tens of thousands of armed terrorists attacked Qara and used it as a base from which to carry out attacks. However they were only able to carry out two or three small attacks from there. Together with Muslim families, including children, we hid in the basement of the church, not giving away any signs of life. Muslims took care of us and we took care of them, while we entertained their children as best we could. We all had our hands full to keep them busy. Also, to keep them from being afraid, while for us there was no time to be afraid. We moved some furniture inside, and behind the furniture the Muslim women slept. We slept on the other side. For a whole week, we had no water, but luckily there was snow. We had a garden which provided us with some almonds, cherries, figs and grapes. We also had bags of corn in the basement, which we ate from. It was an eye-opening experience, living together. On a Sunday morning, the door was opened, a man came in and said, “It’s over“. His name was Ruah Allah, i.e. ‘Spirit of God’! Hezbollah helped a lot in fighting off those terrorists in Qara. They were the first to provide help; along with the Syrian army, they protected and saved the people of Syria. The fact that we’re still alive is otherwise inexplicable. Qara was very dangerous in November 2013. Hezbollah was originally set up because Zionists murdered their wives and children and destroyed their homes. 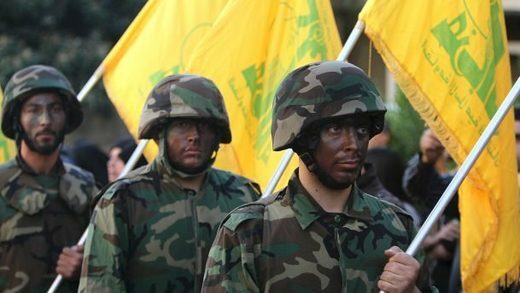 They’re young idealists who joined Hezbollah as resistors, who want to serve and protect their people, but also, as it were, have sworn to help those who are similarly being threatened by the same kind of brutal aggression. And, if Syria would fall, then Lebanon wouldn’t survive more than a few days after that, either. The idealism of those young people was inspiring. As Shiites they work together with Syrian soldiers, most of whom are Sunni. They also work well together with Christians. It was a pleasant experience. They continue to protect the population and therefore us. Near the end of 2013, the army and Hezbollah cleared the town of terrorists. One after another terrorist group fled. We don’t know how exactly it happened, but the Syrian army and their allies had the upper hand. There were still some small groups of rebels left at the time. But, soon after, some residents returned, shops and business re-opened and the spirits of the people were lifted. Some residents came back to help to rebuild. Our garden has been more or less damaged, but we are working on restoring it. Brave Hezbollah soldiers, putting their lives in danger to protect the Syrian people. We are also very thankful to Russia. If Russia didn’t come in 2015, then we would not be here today and Syria would not exist anymore. Russia says what it does and does what it says. We haven’t had direct interaction with Russians. Northern Aleppo had more contact with them. But we have seen trucks full of humanitarian supplies from Russia. A lot was organized. Certainly, the Russians have their own reasons for being there. Just as the US is there to serve its own agenda, which wants to achieve it by destroying Syria and putting puppets in charge there, as they have done to other countries in the past 25 years, with 20 million deaths as a result. Russia on the other hand wants to do anything it can to create stability for the country, and also for its own safety. They support the idea that the country itself should choose its own government and president. They want to protect the stability, integrity and sovereignty of the country. And if Russia has some kind of an agenda in all of this as well, well, then my choice regarding whether I’d want the US or Russia here has been made quickly. We have nothing more than appreciation for the Russians. As I said, we didn’t have personal contact with them. But based on what I’ve seen and heard from Syrian citizens, I know enough. And you have to admit, Putin sure is an artist. Russia put up no-fly zones, against the US! It is exactly the opposite of what the US wanted to do: to provide no-fly zones in favor of the terrorists, not in favor of the Syrian army. And, while the so-called international coalition has more military power, Russia manages to do so much more. Russia is four times better than all those who protect and transport ISIS puppets to serve their political interests. 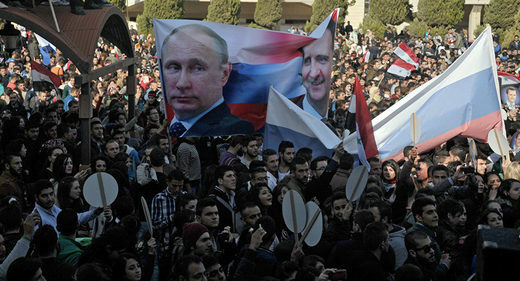 Syrians feel immense gratitude towards Russia and President Putin. 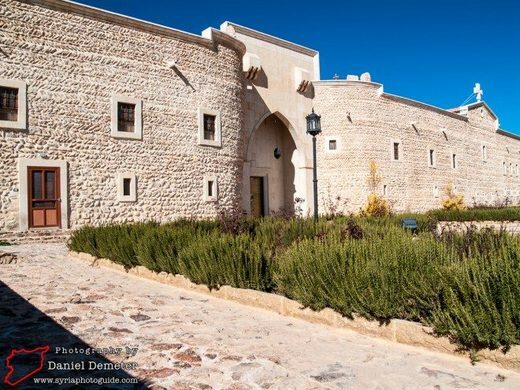 Since the beginning, Mother Agnes-Mariam established three centers: in Jerama (Damascus), Qara (the Monastery) and Tartous. We’re receiving many containers, but you can’t do anything with those supplies if they aren’t organized. There are a lot of medical supplies for many hospitals, everywhere people need medical help. We work day and night on organizing these supplies, and other kinds of supplies. We receive medical supplies, clothes, and food at our storage room, then we select and organize them. We quickly first take food out from the containers (due to their expiration date). We put everything neatly in boxes, and write down what and how much is in each box. These boxes are then sent out. It’s tragic. The terrorists are very well cared for and armed by their sponsors, while Syrians are in need of medical help. Terrorists destroyed many hospitals, a whole series of hospitals in fact. Thankfully, in cooperation with the Red Crescent, Sweden has offered us a big hospital including all equipment. It’s a perfect and modern clinic, which we are very thankful for. And since the beginning, we received very great help from the Dutch organization Dorcas. In addition, Mother Agnes-Mariam, with the help of hundreds of volunteers and some paid workers, have been providing warm meals in Aleppo since September last year. 25,000 warm meals, five days a week, for two months, using products from the region – which also supports the work of the region. The miracle is that it was foreseen happening for two months but continues to this today! There’s been much emphasis on rebuilding. This month I went back to help do that. Families with children have moved elsewhere, they said they want a future, certainty and safety. However, others have stayed, especially a group of enthusiastic young people, who have many ideas and provide much work and effort in rebuilding Qara. And every day, one of our sisters sets up creative knitwork for 35 women in the village, which the women receive an income from. The knitwork is sold, given or sent to friends abroad. Many have thanked us for our work. We also grow mushrooms, and there are many other small activities that help people earn an income. There were people with a handicap in the town because they had isolated themselves, but we invited them to the monastery for Easter; it was a unique experience for all of us. They then felt part of the community and have started working also; they have now been integrated into society. We’re also working on a carpet factory, where people can work on making carpets. The population is probably not waiting for carpets! But we will try to sell them outside to help citizens gain an income. We have to truly be thankful for what we have. We’ve also worked on restoring our gardens and orchards. This area has the best cherries in the whole world. They used to sell containers full of cherries to Saudi Arabia. Unfortunately, much have been destroyed. But we have planted thousands of tiny plants and small trees. 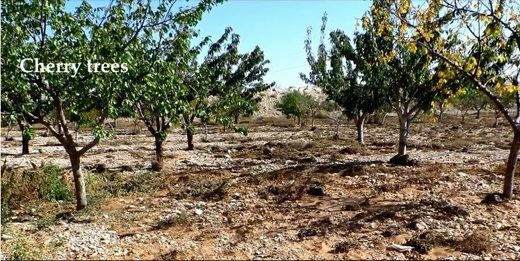 ‘If ye walk in my statutes, and keep my commandments, and do them; Then I will give you rain in due season, and the land shall yield her increase, and the trees of the field shall yield their fruit.’ (Lev 26:3-4) – Cherry trees in Qara. The country has become much more united. During the festive meeting of martyrs, one could clearly see the unity of the people, between Alawites, Catholics, Shiites, Sunnis, Christians… We have become one family, that continues to become bigger and stronger. Certain people can murder, kill, destroy infrastructure, but bringing a country to its knees will not happen. Figure this: Alawites are probably ‘worse’ for Muslims than Christians, as the Alawites haven’t taken anything from Islam. And it is this man, President Assad, who is being supported by all, including the 70% Sunni Syrian population. We live together as one family. We work together towards the same society – and that is very strong. There is hope. Solidarity will grow, and the harmonious connection is still there. Every country has its shortcomings, but in all of the misery, there are heroes. There are heroes and there are holy men. Amongst Muslims and others. We can also see that there is a move from a unipolar world to a multipolar world, and I hope that for Syria this year we’ll continue to make progress. We’ve been through many years of war, but our unity has only become stronger. Journalists also tend to ask about the ‘civil war’, to which he replies that there never was one. “They want to paint a certain picture. They want to hear stories of the brutal dictator. I’m pretty certain those interviews were never broadcasted,” he told me with a laugh. He didn’t give the answers they wanted to hear. He told the truth. Originally from Afghanistan, Bahar Azizi lives in Europe, holds an MA in psychology, is an instructor in Éiriú Eolas meditation, and is a keen animal lover. Bahar has been a contributing writer and editor at SOTT.net since 2012 and occasionally co-hosts the ‘Behind the Headlines’ show on ‌the Sott Radio Network.